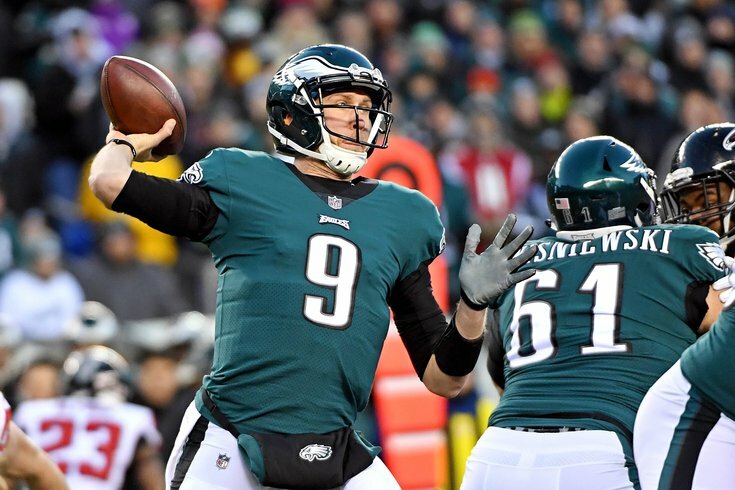 Nick Foles throws a pass during the first quarter against the Atlanta Falcons in the NFC divisional playoff game at Lincoln Financial Field. After a regular season in which it became pretty obvious early on that the Philadelphia Eagles would be competing in the playoffs, their first playoff game is finally here. Eagles-Falcons weather update: Who does it favor? Their opponent is the Atlanta Falcons, a very formidable team that went to the Super Bowl a year ago, and is coming off a big win last week in Los Angeles against the Rams in the wild-card round. As we noted in our five matchups to watch when the Falcons have the ball, it is imperative that the Eagles' defensive line take control of the game both against the run and the pass. When the Eagles have the ball, they must find a way to run the football, even when the Falcons stack the box. The Eagles have weathered devastating injuries all season long, most notably to Carson Wentz, Jason Peters, Jordan Hicks, and Darren Sproles. However, their current injury report includes just two players, who are both listed as questionable. The Falcons, meanwhile, have had incredible injury luck all season long, and list no players on their injury report. Here's the full Eagles-Falcons injury report, with analysis. It may have been noted a few times this week that the No. 1 seed Eagles come into this matchup as an underdog against a No. 6 seed. Has anyone read that? Well, it's true. The Falcons are favored by either 2.5 or 3 points, depending on where you look. You can find a roundup of local, national, and Atlanta-based picks for this game here. For the gambling degenerates, you can find our divisional round picks here. Feel free to comment on the game below.